In 2 Kings in the Old Testament, Naaman, who is a Captain of the guard for the soldiers of Syria has a situation. He has leprosy. He has a problem he needs fixed. His wife's KIDNAPPED servant suggests they appeal to the Prophet Elisha, the spiritual leader of the ENEMY. Catch those words? One could easily understand if there was animosity there. But there wasn't too much because Naaman followed the suggestion. The King of Syria wrote to the King of Israel and Naaman took a massive entourage to visit Elisha. Elisha sent a servant out with directions. The directions were simple. 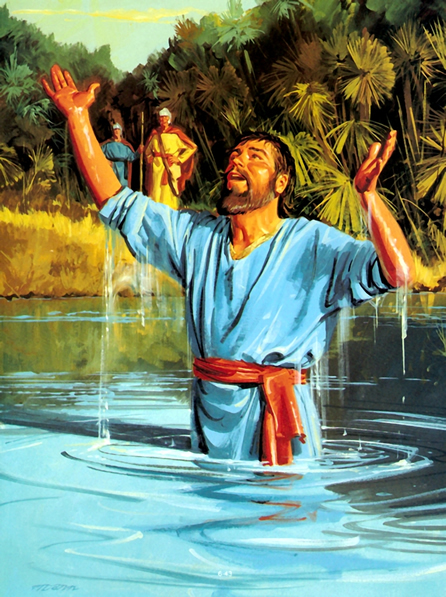 Wash in the Jordan River 7 times. Naaman was kind torqued off that the Prophet would not come out to meet him himself, and insulted that the "fix" was easy. Then enters the smart servant. He says "Why not give it a try. What harm could it do?" So he did. And he was healed. Naaman must have had some amount of faith, or at least a desire to believe in order for that to have worked. Here is how it applied to me. Recently someone, who has succeeded where I wish to succeed, gave me a piece of advice. A simple piece of advice. Publish more to my blog and focus more on us on my social media accounts rather that stressing adoption every single post. I thought "who are you to tell me what to do. You're young, you don't know what it's like to wait.." Wait. She doesn't know what it's like to wait. Maybe I should listen. I say I am willing to sacrifice, I claim I want it more than anything. I profess my deep desires. Which are all true. But what am willing to SHOW the Lord I am willing to do? How much good is it to say "I know I spend too much time on my phone and not being a great mom, but I will be better when we get another one." It's like when my son asks for a tootsie roll. I tell him no because he hit me. He says "I won't do it ever again." and expects he will still get the treat. I believe the Lord said faith precedes the miracle, not the other way around. When we adopted Panda we had been struggling, then I remember a distinct shift in my heart. Things started to fall into place. We didn't know that's what it was until after we adopted. I have been striving for that same shift of feeling. But I'm not there yet. You can't manufacture a change of heart. It has to be real. I'm not going to announce drastic monumental changes to my life in this effort. But I am going to listen to the whisperings that say "What can it hurt to try?" I'm going to try and ask myself if my actions show faith or simply expect rewards. But the best thing is when I succeed, it doesn't necessarily mean we will end with a baby girl, like I want. But no matter what, I will end up better in my faith and my ability to listen to the spirit. My relationship with My Heavenly Father and my Savior will increase. So again, I ask, "What can it hurt to try?"